Everybody enjoys a good night’s sleep. In fact, we spend one-third of our lives sleeping. However, as we age we are at a higher likelihood of experiencing sleep disturbances which can impact sleep duration or quality. Sleep disturbance is also a well-established phenomenon in patients dealing with cancer given the symptoms and side-effects of the cancer treatments that can directly or indirectly affect sleep. The number of older adults with cancer is growing and more than 60% of new cancer cases occur in adults aged 65 and above. Therefore, it is important to understand how older patients are being affected by sleep disturbance as well as how impaired sleep impacts their lives so that appropriate steps can be taken to help them. In a recent study, a group of geriatric oncology researchers from the University of Rochester and the University of Chicago have attempted to tackle this issue. The researchers surveyed 389 older patients with cancer who were referred to their clinics that specialize in the evaluation of older patients with cancer (Specialized Oncology Care & Research in the Elderly). Patients were asked whether they have sleep problems at the time of the visit. In addition, patients underwent various assessments of their physical function and cognition. In this study, the researchers found that almost 40% of older patients with cancer seen in these clinics reported sleep disturbance. Patients who self-reported sleep disturbance were more likely to report that they were unable to perform activities such as shopping, cooking, managing medications, using the phone, doing housework, manage finances and driving/using public transportation. They were also more likely to have limitations in performing physical activities such as climbing several flights of stairs, walking more than a mile, lifting or carrying groceries, etc. On the other hand, sleep disturbance was not associated with impairment in cognitive screening tests. This study supports prior studies in the general older adult population and emphasizes that healthcare professionals should ask older patients with cancer whether they have sleep issues and how these have impacted their physical function. There are well-established treatments such as cognitive behavioral therapy and exercise which can help patients with cancer get better sleep. Future research should assess the relationships between sleep, physical function, and cognition in a longitudinal fashion in older patients with cancer. Methods such as actigraphy or polysomnography may also provide a more objective way of measuring sleep. These findings are described in the recently published article entitled Associations of Sleep Disturbance with Physical Function and Cognition in Older Adults with Cancer, in the journal Supportive Care in Cancer. This work was led by Dr. Kah Poh Loh (Melissa) from the University of Rochester School of Medicine and Dentistry. 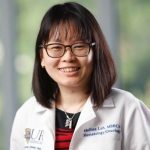 My current research interests include three areas: 1) mobile health behavioral interventions (including exercise) for older patients with cancer, 2) decision-making process in older adults with acute myeloid leukemia, and 3) geriatric assessment (GA) and GA-driven interventions in hematologic malignancies. I am also interested in other areas of geriatric oncology such as barriers to transplant, polypharmacy, and communication.